Once you have mastered the easy art of Slow-Roasting Tomatoes, one of the greatest things you can do with your new skill is make marinara! This is a good, simple marinara that pulls its flavor from the slow-roasting technique. Once you have this recipe down, feel free to tweak seasonings, etc. to make it your own! Pass roasted tomatoes through a food mill (or puree and strain) into a bowl. Set aside, keeping warm. Heat oil in a large saucepan over medium-high heat. Add onion, garlic, and oregano. Saute for 5 minutes, or until tender. Add wine. Cook 3 minutes, or until liquid nearly evaporates. Stir in tomato mixture and 2/3 cup water. Bring to a boil. Cover, reduce heat, and simmer 15 minutes, stirring occasionally. Remove from heat and stir in salt and pepper to taste. Ladle the sauce into the one-pint jars, leaving 1/4 inch of head space. Remove any air bubbles if necessary. Wipe the rims clean and seal tightly with the lids. Process the jars for 30 minutes in boiling water bath. Mm! Another score for the food mill. Looks like I need to get mine cranking and make some sauce before summer is over! Beautiful. 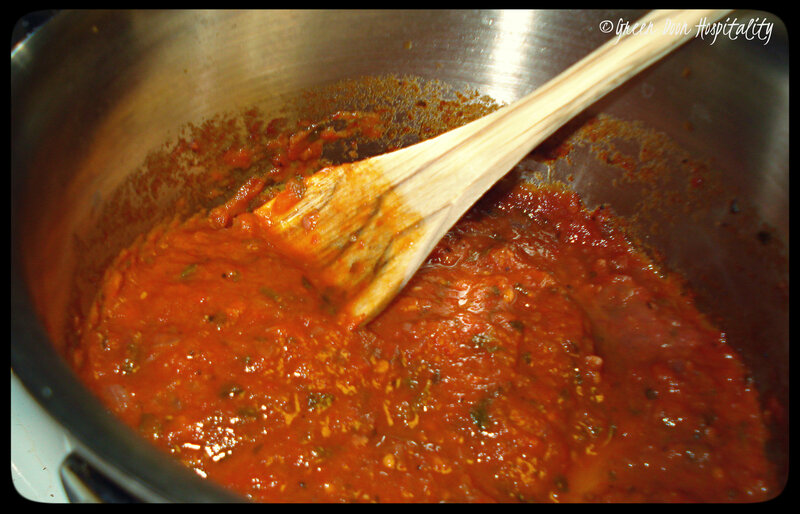 Love making marinara sauce! I make this all the time. Mmmmm–I love a good marinara. My favorite comes from Marcella Hazan–it’s literally canned tomatoes, an onion and butter and it’s out of this world–but I really want to try this version now, too! You had me at homemade and slow-roasted – YUM! I am catching up on visiting my favorite blogs after such a busy summer and am so glad to have seen this post, Kenley. Unfortunately, the heat and the Cactus Wrens have taken a toll on my tomatoes. Roasting is the way to go to bring out the best flavor, even from grocery store tomatoes! Hope you are doing well! We love Italian food SO much, I definitely would be canning this recipe, if I had a garden. You know how I feel about tomato-based sauces! This entry was posted on August 13, 2013 by Jessica Romigh in Homemade Staples, Pantry Preserving and tagged canning, Cooking Light Magazine, garlic, gluten-free, marinara, oregano, red wine, sauces, slow roasted tomato marinara, slow roasted tomatoes, sweet onion, vegan, vegetarian, yellow onion.